This is a new page where we will post "local" and Lodge events. This will consist of the reports from our new team of "volunteer" Media Liaison Officers (MLOs) who have been asked by the PGM to provide an accessible, local link with all RAM and Mark Lodges. Your Lodge Secretary should be aware of their MLO and advise them of the more "domestic" events that are of interest to all in general rather than the larger events already reported on by Provincial staff. You should see these events also reported upon in our Facebook Page (which is closed to members only) at "Essex Mark & RAM". Please visit this group and ask to join if you are not already in that group. Please be aware that this News Page is Publicly viewable, you should have been reminded and asked whether you wish your details to be made public. If you DO NOT want this to happen, please inform your MLO accordingly. All Lodge Secretaries have been made aware of their relevant MLO, please ensure that YOUR Lodges keep in contact with them so that news can be circulated within our membership and outside so that Mark Masonry continues to attract new members and retains existing ones. VWBro Anthony Latham, APGM and WBro. Richard Goodwin, GJD. A most enjoyable day (if a little damp on the outside) and we look forward to welcoming Sussex Masons to our meeting at Felsted in May. Oakleaf Lodge of Mark Master Masons, meeting at the Crossed Keys Centre, recently held its Installation Meeting. Pictured below are W. Bro John Crates (centre) who was installed as Worshipful Master of Oakleaf for the third time. On the right is the Installing Master W.Bro Dave Richards. To the left is V. W. Bro Tony Latham who is Director of Ceremonies. We congratulate John on his longevity (he states he was very young the first time round!) and hope he has honed his ritual since they have a prospective candidate for Advancement at the next meeting in November. That being David Weightman, a PM of Sancto Claro Craft meeting at Orsett who signed up after a recent Mark Awareness Evening. Aurelius MMM Lodge will be holding a BBQ/Funday on Saturday 1st of June at Colvin Memorial Temple , Clacton - on-Sea, in aid of Sponsor A Sibling and Essex Mark Welfare Fund. The day starts at 1 PM and finishes about 10 PM ish. In true Aurelius tradition the bar will be open all day. The day will be finished off with a disco. The event is open to all, but it is a ticket only function. Tickets can be pre-booked by contacting Dave Todd davetodd471@hotmail.com or call 07930596371. Tickets cost £10 adult £5 child under 14. There is an event caterer providing the BBQ and several stalls ranging from bottle tombola cakes, bric a brac and pitch and put, and children's entertainment. Sponsor A Sibling will be in attendance with their gazebo kindly donated by Essex Mark Masons. ​Stilus et Denarius Lodge, No. 1735 had a great meeting and festive board at Maldon Masonic Hall on Friday 22nd March. The Lodge was consecrated primarily for Secretaries and Treasurers of Lodges in the Province to meet and share best practice. It is, however, a "proper" mark Lodge and guests are always welcome, particularly those who might wish to be a Secretary/Scribe or treasurer in the future. On this occasion, Bro Ian Simpson from the Viking Lodge (well known in the Holy Royal Arch), attended, and gave an excellent talk on "Freemasons in Captivity", on the subject of which he has also written a book. The Lodge was pleased to present Bro. Simpson with a cheque for £200 towards the TLC of which he is the founder. Our Provincial Grand Secretary, W. Bro Peirre Wadduops, updated the members on future activities and admin requirements, which was followed by a lively questions and answers session. A good time was had by all. 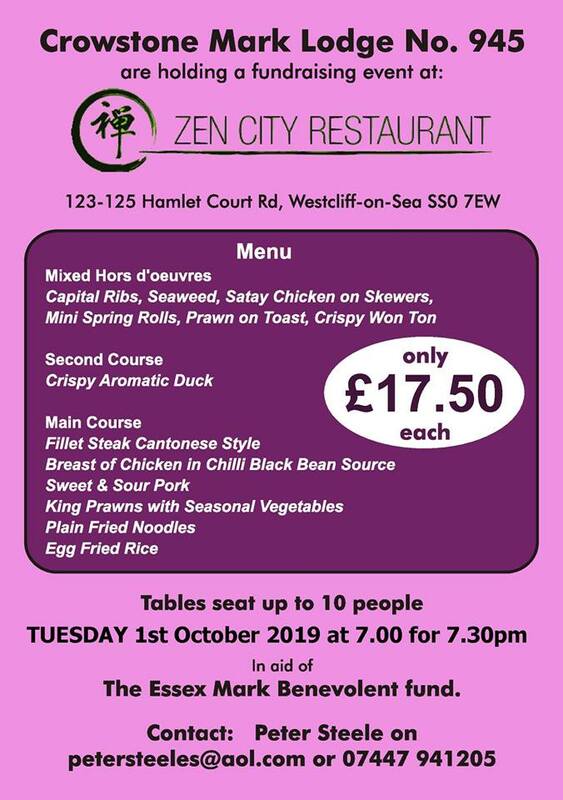 Building on the success of previous events, the Crowstone Mark Lodge is once more to hold its "World Famous" all you can eat buffet night at its home venue of Zen City Restaurent. As ever, this event is well attended so, as some may remember, "Book Early"! Brentwood Mark, No. 377; an Installation, a PGM and a real treasure! 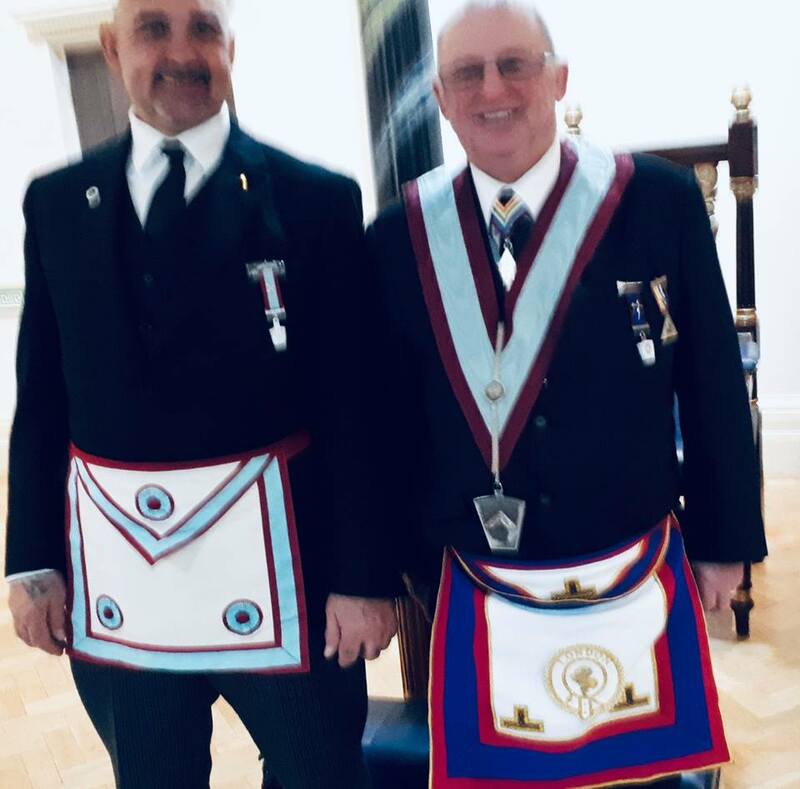 Brentwood Mark recently held its Installation meeting where Jack Saunders was Installed Master. Jack will be known to many as one of the communications team and largely responsible for our "social media" output. A keen, committed and young(er!) Mark Mason, Jack said "Just home from Brentwood Mark No .377 where I was installed into the chair of Adoniram. What a nerve-wracking evening, but thoroughly enjoyable! I am looking forward to Advancing a candidate into our wonderful Order. I thank all the officers, members and the many guests who attended also"
The Provincial Grand Master, RWBro. Terence Sheern, in recognition of Jacks' commitment to Mark Masonry, made an unofficial visit and was very pleased to receive a cheque for the Essex Mark Welfare Fund from the new Master. Now for the "real treasure", one of the members of the Lodge, W.Bro. Phil Hind brought to the meeting a storage box that had been in his loft for over 15 years (Phil was Advanced into Brentwood Mark 20yrs ago). any or some if the items. "This is a real treasure trove," said the Provincial Grand Master, " and I urge all Lodges and members to check their own records and collections to ensure that none of our valuable and unique history is lost. We must ensure that we preserve, retain and display our history so that we can create the memories of members yet to come"
The Provincial Grand Master, escorted by the Provincial Grand DC and accompanied by a retinue of Active Provincial Officer made the perilous journey north (almost beyond The Wall) to visit the Beriffe Lodge for their Installation meeting. In a fine Ceremony, Worshipful Brother Jeff Hierons was again Installed into the Master's Chair for another tour of duty. After the meeting the Worshipful Master had great pleasure in presenting the PGM with a cheque for £2000 towards the Essex Mark Welfare Fund. 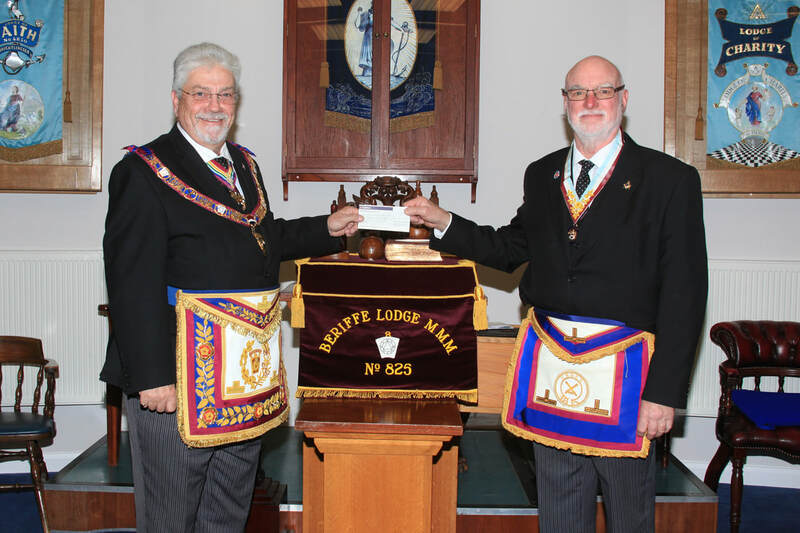 Members of the Lodge also decided to donate £500 to the Brightlingsea First Responders, who assist the Ambulance Service look after us in time of emergency, and in fact one of our members whilst clearing the Dining Tables was taken ill and the First Responders attended within a few minutes of being summoned and assisted until an Ambulance arrived to take over. A further £500.00 was also donated to the Essex Air Ambulance which is often seen landing in Brightlingsea to give aid where necessary and an asset to the County as a whole. Finally, a further £500.00 was sent to one of our Brightlingsea girls, Jemma, who having taken a year out after University and, teaching in Ghana, realised how deprived the children were and started her charity and regularly visits in school holidays in spite of her teaching job in Southend. More details can be found on the website https://porridgeandpens.org/ . The Mark of Industry RAM & Mark Lodges meetings were held on Saturday 9th February at the Upminster Masonic Centre. W.Bro. John Barns installed W.Bro Richard Hollier as Worshipful Commander in the Royal Ark Mariner Lodge in an excellent manner. After refreshments, W.Bro Hollier, who is also the current Master of the Mark Lodge, advanced Bro. Lee Low into the Degree of Mark Master Mason in a very memorable ceremony. The brethren enjoyed a festive board of Scottish Fare, which included the inevitable Haggis and traditional address to the Scottish national dish. The DPGM, VWBro. Richard Bowyer, escorted by WBro. Andrew Watson, ProvAGDC made an official visit to the Aurelius Lodge of MMMs which meets at Clacton on Sea. Pictured below are members of Aurelius Lodge and visitors.with the DPGM. Before the Mark meeting, Aurelius RAM Lodge were also honoured by the visit of V.W.Bro. Richard Bowyer. The meeting consisted of a double Elevation for Brothers Alan Penny and Martin Pearce. The ceremony was carried out by W.Bro. Ken Headworth as the Commander, Ken Finch was unable to attend. The ceremony was carried out in an exemplary manner by all Lodge Officers. The Mayflower Lodge of Mark Master Masons No 1536 had two candidates to Advance at their meeting on Thursday 7th February, held at the Orsett Masonic Hall. In these times where some Masonic units are finding new members harder to come by, it is pleasing to see Mayflower Lodge and Mark Masonry continuing to grow. Pictured below are the Worshipful Master is pictured here with the two new members of the Lodge.